The American cable channel STARZ has now been trying for several years to rival other American cable channels with AMC, Showtime and HBO at the top of the list. It had been broadcasting only film productions until 2005 and so there is no wonder that it has been beaten by its rivals in ratings especially with their original TV series production. Spartacus therefore became one of the first and also most successful STARZ’s original series (the first season Blood and Sand was reviewed by Kristýna Oslzlová in an article called Spartacus’s final battle) that has now been renewed for a second season before the pilot episode of the new season was even broadcasted. After the first season was broadcasted, the leading actor Andy Whitfield suffered a serious illness. STARZ therefore had to face a decision whether to continue with the series or not. Eventually, with Whitfield’s support, they decided to film a prequel Spartacus: Gods of the Arena and wait patiently for the actor’s condition to get better. That unfortunately never happened and so the studio decided to recast the main role and continue with the filming of the second season called Spartacus: Vengeance. This season takes place several weeks after the rebellion of gladiators at the ludus of Gaius Batiatus portrayed in the first season and the prequel by John Hannah. The Vengeance both in narrative and style seemingly continues where the Blood and Sand has ended. The tone of the series however has considerably changed not only in Vengeance, but also in Gods of the Arena prequel. The latter can be in many ways considered to be a transitional stage between both seasons. One of the main causes for the change in tone is apparently the recasting of the leading actor and Andy Whitfield’s passing. One can’t say that the latest season1 is worse or better than the preceding one. It is however absolutely different. Not in the style or controversy (beloved characters are still dying unexpectedly), but in the interpretation of the characters and their narrative lines. Compared to the first season, the narrative lines have sometimes even dramatically changed their role. At the beginning of the new Spartacus: Vengeance season, we, the audience, get relatively comprehensive information about the whole range of characters involved, that even strengthen the feeling of uncertainty about their future destiny. Oenomaus alias Doctore is no longer viewed as a dauntless gladiator mentor, but as a man, who has lost all the most precious things in his life with only honor remaining, and even that is fading away after the Gladiator School of Batiatus vanishes into puddles of blood. Crixus ceases to be a malicious and spiteful gladiator, but fights by Spartacus’ side trying to gain back the love of his life. Half mad Lucretia (Lucy Lawless) returns into the picture in spite of the surprise of all the characters (maybe?) and is joined by Ilithyia (Viva Bianca) with her husband, Roman praetor Gaius Claudius Glaber (Craig Parker), at the ludus. Characters narratively overshadowed in the first season are strengthened, especially Germanic gladiator Agron (Daniel Feuerriegel), Spartacus’ (Liam McIntyre) left hand, who became one of the most popular characters of the series. Even Spartacus himself undergoes a transformation due to the change of the actor and gains a completely new dimension that is different, but at least as good and credible as in the case of Andy Whitfield. It might therefore be a little difficult for some viewers to get used to a new type of actor and so a new representation of the character, but after the second or third episode one usually stops perceiving the differences as important and accepts the new tone of the series as his own. It seems in fact that the creators started to focus not only on the “male” audience who prefers blood dripping action, but also invested into a detail characterization of the relationships among the characters. Each and every one of them is portrayed in detail, placed into the context of other relationships and historical events and is absolutely credible and comprehensible, whether it is an honest body slave Nasir (Pana Hema Taylor) or deceitful former gladiator Ashur (Nick Tarabay) and vengeful and yet naive Seppia (Hanna Mangan Lawrence). As series fans aptly observe, these are characters that we love to hate (or love to love). The target audience is evidently not exclusively male, as Spartacus used to promote in the United States at the beginning, but quite clearly also female, gay and alternatively gay friendly. Apart from displaying explicit and even naturalistically presented violence, Spartacus is famous for its representation of the Roman hedonistic society. As the creators themselves, especially Steven S. DeKnight, confirmed, history is merely a guideline for them and Spartacus is by no means trying to be a realistic reflection of the Roman society of the time. On the other hand, DeKnight and his team masterfully take advantage of the gaps in the Roman history both in presentation of sexuality and in interpersonal relations and even push forward the current representations of neglected social groups by several media, especially television, to completely new levels that even HBO or Showtime, the biggest rivals of STARZ, would be proud of. That applies to all Spartacus seasons, but at least doubly so to Vengeance. Even though it seems that after the two first seasons, Vengeance slightly lowers the scandalous tone in explicitness of displayed sexual acts and most creative ways of murdering people, it provides the viewer with what is so far one of the best portrayed gay romances in the history of American television, although it seems that American critics can’t adequately appreciate it just yet. Gay identity and sexual independence in ancient Rome relationships were presented since the very first season of Spartacus. Every indication was nevertheless always interrupted by a brutal death before a fully elaborated narrative line could adequately develop. 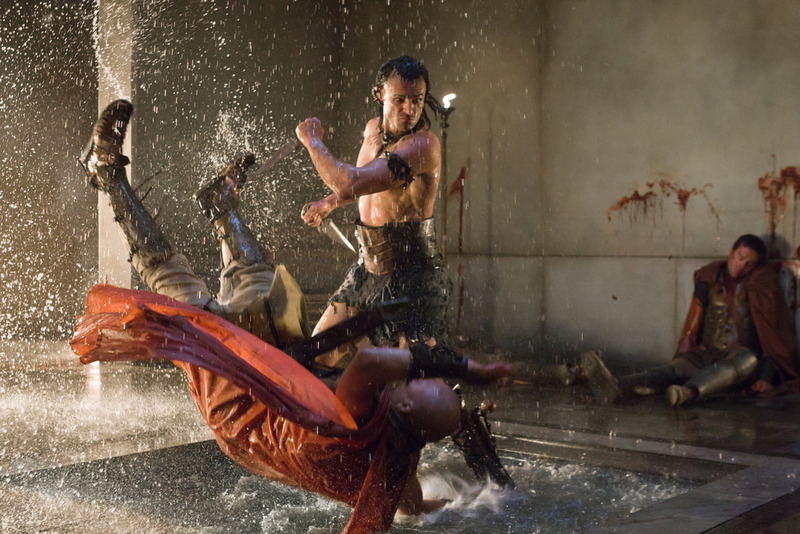 The closest to the goal, until Vengeance, were the characters of gladiator Barca (Antonio Te Maioha) and young servant Pietros (Eka Darville) in Blood and Sand, where both characters died in the middle of the season. Alternative sexual identities are presented in Spartacus from a modern point of view rather than from the “real” historical one. This can be seen in how they are represented as stable identities in an equal partnership, not as an unequal relationship of a teacher and a pupil, who are both in the same social class. At least that is how Michel Foucault would have seen them. Ironically, such an approach makes it possible to enrich the discourse of the gay media representation with characters and narrative lines that would never make it onto the conservative American broadcast2 in particular. That is after all the case of the couple that is, by the newly formed fandom, called Nagron, i.e. above mentioned German gladiator Agron and body slave Nasir, who was freed from slavery in the second episode of Vengeance. As opposed to a range of other gay (and a few lesbian) couples in American broadcasting, Agron and Nasir are constructed as complex characters, not characterised exclusively by their sexual orientation((A similar technique in American broadcasting can currently be seen only in the cop show Southland. )) and with only one exception are portrayed with the same scale and depth as the heterosexual characters and couples (which may seem startling also because they are merely supporting characters, however Argon is one of the main supporting characters). The mentioned exception is the absence of an explicit sexual scene, scene that is called for both by fans (especially female ones) and several critics. Its absence is nevertheless narratively grounded and due to the changed pace of the series also understandable (and to fandom’s delight expected in the forthcoming season). Another untypical step in the gay characters construction is their ambivalent dynamics. The characters don’t take over the classical stereotypical division into feminine and masculine, but they develop an equal relationship that reflects in the context of the series also their equality within their newly acquired freedom as once enslaved foreigners (Agron comes from Germania, Nasir from Syria). Last but not least it is important to point out the interpretation of those two characters not only in the moments, where both men appear in front of the camera but also in the moments, where they are “only” a part of the acting background. It is not customary in American series for a relationship of a gay couple to be portrayed in such detail even in the scenes, where it appears seemingly out of the camera’s focus.3 The result is a high-quality construction not only of the characters, but also their relationship, that suddenly gets lifted to the same level as that of main and narratively preferred characters. That is after all the case of the couple that is, by the newly formed fandom, called Nagron, i.e. above mentioned German gladiator Agron and body slave Nasir, who was freed from slavery in the second episode of Vengeance. As opposed to a range of other gay (and a few lesbian) couples in American broadcasting, Agron and Nasir are constructed as complex characters, not characterised exclusively by their sexual orientation((A similar technique in American broadcasting can currently be seen only in the cop show Southland. )) and with only one exception are portrayed with the same scale and depth as the heterosexual characters and couples (which may seem startling also because they are merely supporting characters, however Argon is one of the main supporting characters). The mentioned exception is the absence of an explicit sexual scene, scene that is called for both by fans (especially female ones) and several critics. Its absence is nevertheless narratively grounded and due to the changed pace of the series also understandable (and to fandom’s delight expected in the forthcoming season). Another untypical step in the gay characters construction is their ambivalent dynamics. The characters don’t take over the classical stereotypical division into feminine and masculine, but they develop an equal relationship that reflects in the context of the series also their equality within their newly acquired freedom as once enslaved foreigners (Agron comes from Germania, Nasir from Syria). Last but not least it is important to point out the interpretation of those two characters not only in the moments, where both men appear in front of the camera but also in the moments, where they are “only” a part of the acting background. It is not customary in American series for a relationship of a gay couple to be portrayed in such detail even in the scenes, where it appears seemingly out of the camera’s focus.4 The result is a high-quality construction not only of the characters, but also their relationship, that suddenly gets lifted to the same level as that of main and narratively preferred characters.